This weekend is 24 Heures du Mans 2018- our friends at Jalopnik have put together this handy Guide to the 2018 24 Hours of LeMans, and so we figured, what better time to chat with an actual LeMans veteran about what it was actually like to run. Chatting with STILLEN founder and 1990 and 1994 24-Hours-of-LeMans veteran Steve Millen about the 24, we asked what his thoughts were on this years race, and some of his recollections about his own experiences at the iconic french track. STILLEN Founder Steve Millen has been applying his racing knowhow to the STILLEN range of performance parts and aero for over 25 years now. Steve Millen has had the chance to race the 24 Hueres du Mans twice, in 1990, snagging the title “Rookie of the Year” in the process, and then raced the 24 again in 1994 with the Nissan factory team, taking 5th overall and winning his class, in spite of a rather inconvenient theft, delicious french breakfast, and a mechanical failure. Editor: What do you think about this weekend’s race, taking your experience into account, what kind of a race are we in for? What’s your take on the field this year? SM: When you’re dominant, you’re not racing anyone else, you’re racing the track, and that’s what’s happening with Toyota this year. Every so often in racing it happens that one team is really dominant and nobody can touch them, and this year, that’s Toyota. Back in 1994, we were really dominant and in a similar position. We’d won the 24 Hours of Daytona by 20 laps, and then followed that up with winning Sebring by 7 laps. We were ahead of the field, and that’s where Toyota is going into the 24. 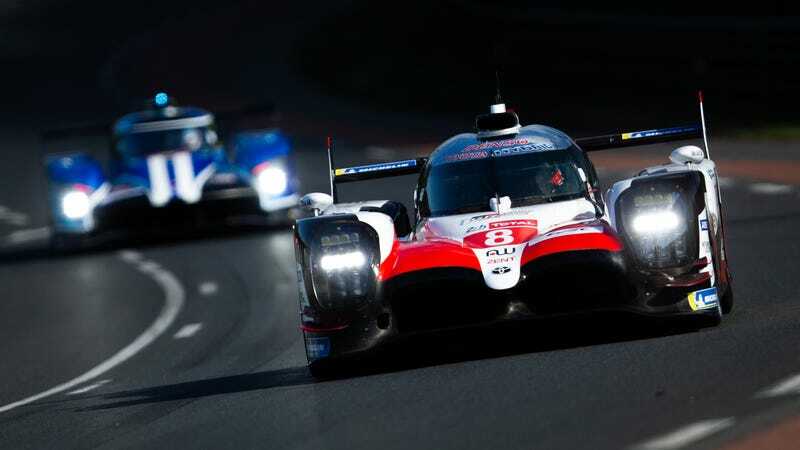 Toyota isn’t really facing any competition that can match its speed – so they won’t be racing the competition, but rather, Toyota is racing against LeMans, the track itself. Editor: That’s very true, in an endurance race, just finishing the race is an accomplishment. As the saying goes, ‘To finish First, first, you must finish.”, right? SM: Right. I’ve always said of endurance races, “The Car Is the Star”, with more than one person driving, it isn’t about the driver anymore, it comes down to how good the car is. In some ways, it’s more challenging- you’re racing yourself. Toyota will be pushing the car to its limits here, and so dominant as they’ve been, it’s their race to lose. Editor: Had the team been planning to go to LeMans that year from the getgo, or was that a spur of the moment thing? SM: No, actually, going to LeMans was a bit of a surprise – We’d been so successful that season, we reckoned we had a shot at LeMans, and so we figured, why not go for it! So Nissan got the budget together to send us to LeMans. Editor: As you said, Nissan’s decision to go to LeMans in 1994 was a bit last minute, do you feel like that presented the Nissan team with any challenges other teams might not have faced? Would you have changed anything on the car if you’d had more time? SM: Certainly – if we’d had more time, we’d have done a different aero treatment for the bodywork. The car was set up for racing in the USA, on road courses where you need a lot of downforce. That meant we had more drag than some of the other teams, but we still didn’t have a problem hitting 200 at 4 different places on the track… in a car setup for grip. Editor: The rules were also slightly different than you were expecting, too, weren’t they? SM: When we arrived in France, were expecting to race under American LeMans rules, and when we arrived, we found we’d be racing under the French LeMans rules, and the GTP class was added and ran at the same time – that added more traffic to maneuver around, and more people to drop oil on the track, go off, all that. Editor: Of the 4 places you’d exceed 200mph, what part of the track was the fastest? SM: The fastest part of the track is coming through the forest out of Mulsanne, well over 200. Editor: If you’d had time, you guys would’ve done something akin to a longtail treatment, then? SM: Exactly, we’d have probably done something similar to the McLaren Longtails. Considering that we were running a high-grip car on one of the fastest tracks in racing, we did really well under the circumstances. The car performed well the majority of the race, until Sunday morning, when we broke a camshaft. Swapping it out took only 20 minutes before we went back out, but that still cost us time. If the camshaft hadn’t broken, we might’ve taken 3rd, or at least 4th overall. Editor: It’s not winning, but either way making the podium would’ve been a great result. SM: We finished 5th overall, and just finishing the 24 is an accomplishment, but we did win our class. Editor: LeMans is certainly one of those “lifetime experience” type events, what do you most clearly remember of racing there? SM: The most memorable thing for me, was around 5-6 am, I was out racing. The thing wasn’t the sunrise… at that time of day the air is the coolest, so the car picks up more power and is the fastest then, and as you’re pushing your fastest, you smell it. The smell of bacon and sausage as kitchens all over the french countryside begin cooking breakfast, and your stomach’s growling in the car. I almost wished I could stop, it smelled so good. I’m thinking, “Man, that smells delicious, how long til breakfast??”. Editor: As a 24-hour race, this also means the car ran at night. Is it harder running in the dark? SM: Actually, you’d be surprised that it’s only dark a few hours during the race. At that time of year, the sun doesn’t set til 10-11pm, and rises around 5-6am, so you really aren’t in darkness for long. Editor: Having run an endurance race myself, ironically in the parodious 24 hours of LeMons, it was hard to stay ‘on my a-game’ after an hour in the car, how often did you switch out? Was getting tired an issue? SM: Actually, no, I always stayed in the car as long as I could, which was 4 hours, and you had to take a 1 hour break in between before you’d be allowed to go out again. Running 4 hour stints at a time lets you stay ‘in the zone’ longer, because you’re adjusting to the track as conditions change, so you don’t have to get used to them all over again so many times if you’re not getting out of the car as often, and so you don’t waste laps adjusting to conditions at the start of each stint. If someone had dropped oil somewhere, or if there was gravel on the track or something, you knew about it. Editor: How would you say LeMans compares to other ‘iconic’ races, like Monaco? SM: It’s more fun than Monaco – there’s so much more opportunity for overtaking, it’s one of the longest tracks in all of racing at over 8 miles, and one of the few courses that’s gorgeous scenery for the entirety. LeMans officials provided me with a caravan (or camper, as we say in the US), but the trick was that both times I ran LeMans, 1990 and 1994, someone broke into my caravan and swiped my racing suits and helmet. Editor: As frustrating as that must’ve been at the time, you did find another suit in time… it’s one of those things you laugh at looking back, isn’t it? SM: Exactly right. It was hectic having to hunt all over the paddock for another helmet and suit, but it’s kind of funny now. *laughing* I always pictured some frenchman on a beat up Moped speeding off through town, wearing my suit and helmet. Editor: Wrapping up here, what are you most excited to see in the 2018 edition of The 24? SM: The cars running now are much more powerful than what I was running in 1994, but I’m curious if Toyota will beat the lap record, rumor is they may do it. We’ll see! Placing 5th overall in spite of unexpectedly having to share the track with GTP class, a broken camshaft, high-drag bodywork for road courses (not LeMans straights) and having his race suit and helmet stolen out of his Caravan, Steve Millen, John Morton and Johnny O’Connell took first in the class, and had the camshaft not broken and if the car had sported a high-speed aero treatment, placing 2nd or 3rd would’ve been very likely. While his professional racing career is over, Steve never really stopped driving fast, continuing to do stunt driving appearances, test performance cars for magazines like Road & Track and still occasionally takes the 75 out to select race events. This August, Steve Millen will be behind the wheel of the #75 300ZX Twin Turbo (Chassis #7) at Weathertech Laguna Seca Raceway the 2018 Monterey Historics, highlighting Nissan as this year’s featured marque. We’ll be posting updates as we revive our LeMans veteran racecar from its slumber and get our 600-1100hp monster ready to race once again. While we haven’t been able to talk Steve into letting us take it for a spin around the block, you can experience what it’s like to drive the LeMans Race Cars like the #75 yourself in incredible detail in Forza Motorsport 6 and Forza Motorsport 7. After being painstakingly scanned into the game by the boffins at Turn10, you can experience what it’s like to drive these iconic vehicles on your favorite tracks. Get behind the wheel Saturday, 6/16/2018 at The Petersen Automotive Museum, for the Michelin 24 Hours Forza Challenge. Set a laptime in the #75 or any other LeMans racecar for a shot at winning an Xbox One X and some other sweet prizes, and thank you to our friends at The Petersen Automotive Museum for playing host. Check out the #75 in action in this hour-long race recap. Whether you want to make your classic 300ZX faster, add more power to your modern 370Z, get more torque from your VR30DDTT Infiniti Q60 or add a 3in lift to your truck, the performance experts at STILLEN can help you do it. Call us today at (866) 250-5542, chat Live at STILLEN.com or stop by the showroom during regular business hours.